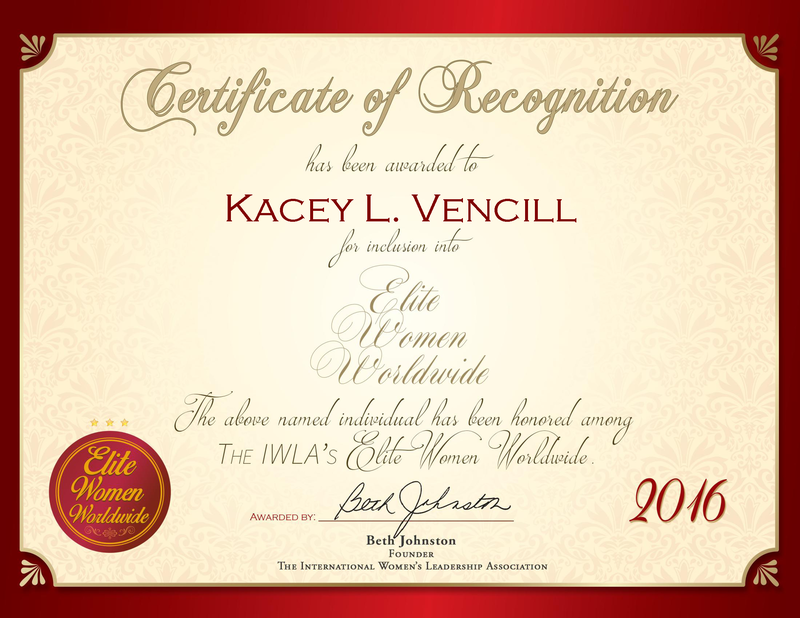 Sacramento, CA, May 19, 2016, Kacey Vencill, Business Owner of Vencill Consulting, LLC, has been recognized by Elite Women Worldwide, for dedication, achievement and leadership in technology consultancy. Ms. Vencill works toward helping behavioral health organizations successfully transition in the changing health information technology industry. With a dedication to fulfilling each client’s needs, she is adept at solving problems and consulting on business services in information technology. She handles a lengthy list of continuing clientele and develops new relationships to expand her services. The company was passed down to her from her mother, and she continues the legacy her mother built. Aiding her career in the information technology field, Ms. Vencill brings her experience as a program business manager and her certification in project management. She uses these skills to solve client’s problems and use innovative techniques to grow the company. One of her greatest accomplishments has been implementing an electronic health record system course for more than 28,000 Medicaid beneficiaries. She attended California State University and Sierra College. Looking toward the future, Ms. Vencill endeavors to expand her services to more providers, as well as add project managers. She enjoys working in this field because it allows her to work in technology and help people at the same time. She has previously worked as a business analyst and programmer analyst for several different organizations, including, California State Controllers, Sacramento County DHHS, Public Sector Consultants and the Department of Health and Human Services of Sacramento County. In the coming years, Ms. Vencill hopes to see change in the information technology industry and be a part of this movement.